Drawing on Harold Bloom’s model of poetic influence and supersession in his famous book, “The Anxiety of Influence,” and considering several historical cases of cross-cultural reception of the natural sciences from the Middle Ages that involved translation, this paper sketches a dynamic for understanding how one culture receives the intellectual riches of another. It argues further that the relative or perceived power relationship of the translator to the source culture can significantly affect the quality and usefulness of the translations. For example, a translator within a victorious culture, with an imperial language, tends to handle the source materials that he acquired from a vanquished culture with greater confidence than a translator in a self-perceived position of inferiority, who may be trying to imitate, catch up, or is defensively preserving a heritage that he fears will be lost. The former is exemplified by the 9th-century translations from Greek into Arabic that took place in Baghdad, and the latter by the earliest phase of the translations from Arabic into Latin that took place in Europe, 12th/13th centuries. Lastly, “anxieties of influence” are adduced as a partial explanation for the systematic attempts to purge Greek thought from Islamic civilization associated with al-Ghazali et al., and to erase Arabic thinkers from the intellectual genealogy of the West, beginning in the Renaissance. Note of Editor: “From Baghdad to Barcelona: The Anxiety of Influence in the Transmission of the Greek and Arabic Sciences” article was presented in the 93rd Annual Medieval Academy of America Meeting, held on 3rd March 2018 in Atlanta (GA), USA. We are grateful to the author for permitting publishing this article on the Muslim Heritage website. 500 years ago, in an academic setting such as this, we would be discussing the works of Avicenna, Averroes, Algorismi, Alhazen, alongside those of Plato, Aristotle, Galen and Euclid. Every educated person in the West knew who these Muslim thinkers were and that they had contributed much to the West. Nowadays, few Westerners have heard of them. What happened? In brief, their ideas became part of the genealogy of Western knowledge, and then they passed into oblivion, disavowed by some Western thinkers, and forgotten by others. Why do we in the West not celebrate the Arabic/Islamic part of our heritage? I argue here that the historical process of translation and appropriation of the intellectual legacy of another culture involves power relationships that affect how the recipient culture receives and remembers the legacy of the received culture. In the case just mentioned, western Europeans at first encountered Arabic thinkers with awe, from the position of a less advanced culture, eager to learn what they could from them. Gradually, however, Western thinkers saw themselves as heirs equally of Greek and Islamic thinkers, and eventually as the rivals of the Arabs as heirs of the classical past. By the time of the Renaissance, there were two strands of thinkers in the West. One group continued to seek valuable insights from the Arabic intellectual tradition, viewing the classical tradition as a continuity from Greco-Roman, to Arabic, to Byzantine, and lastly, to Latin Europe, with themselves as the beneficiaries of this rich tradition. This group included Guillaume Postel and others. The other group, whom we know as the Humanists, sought a more direct route to the Greco-Roman heritage, and bypassed the Arabs and Byzantines, whom they labeled as corruptors of the pure classical heritage. This group included: Niccolò Leoniceno, Giovanni Manardo, and Leonhart Fuchs. The latter strand won out in the West, which is why I, for example, had to take a special course on medieval philosophy before I even heard about the rich intellectual debt of the West to Islamic civilization. Here I consider three representative cases—more are discussed in the article version of this talk. They are: 1) The Graeco-Arabic translations of the High Abbasid period, 2) The Arabo-Latin translations of the post-Carolingian period, and 3) the Byzantine reception of Arabic authors after the devastating Islamic conquests, during the Macedonian Renaissance of the 9th-10th Centuries. 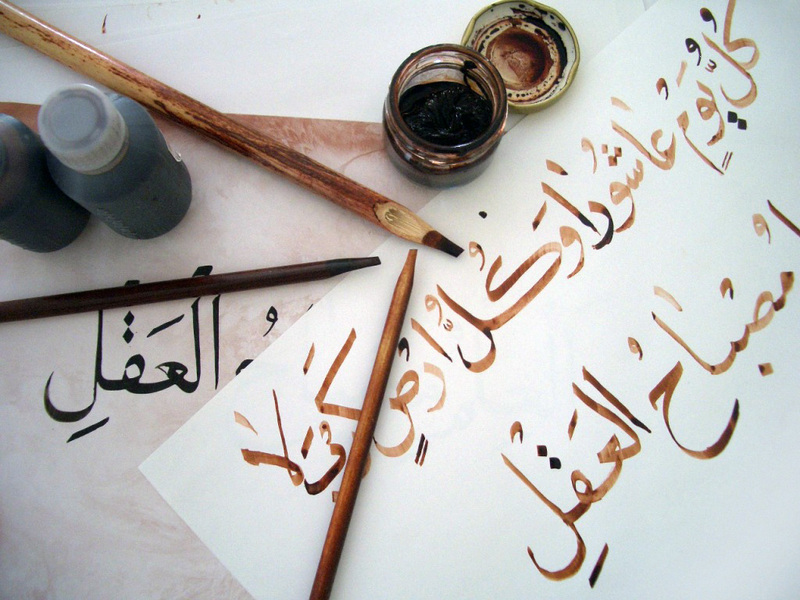 Arabic began as a tribal dialect of Western Arabia, but with the rise of Islam and the conquests in the 7th Century, it became the language of the Islamic empire, from western India to Spain. The Persian Empire was completely conquered, and the Byzantine Empire was severely reduced in size and power. Under the early Umayyads, Greek and Pahlavi continued to be used in administrating those areas that formerly belonged to those two empires. However, Caliph ‘Abd al-Malik (r. 685-705), in order to centralize his power, Arabized everything, and standardized coinage, weights and measures. Arabic gradually became what Latin would become in the West: the language of intellectual, religious, and legal discourse for peoples whose mother languages were something else throughout Islamdom. Thus, Arabic was promoted at the expense of Greek, Persian, and Syriac, the languages of the conquered peoples, who had much older intellectual traditions. As a consequence of the Abbasid transfer of power from Damascus to Baghdad (750 CE) and the establishment of the new regime, the Arab conquerors realized that their subject peoples had intellectual legacies with much to offer to the new Empire. Arithmetic for accounts, geometry for land surveys, astronomy for timekeeping and astrology; philosophy was useful for the development of theology and religious law, and it along with rhetoric were useful for debating with Christians and Jews. All this needed to be translated into Arabic. As George Saliba has argued, beginning in late Umayyad times, some of the early translators came from families who had previously served in the Byzantine or Sassanian administrations, but who had been displaced by court-appointed men who knew only Arabic. These men found careers in translating, and laid the foundation of the epoch-defining Greco-Arabic Translation Movement of 9th and 10th C. Baghdad. Arabic was now the language of the Islamic Empire under Abbasid rule, its capital, Baghdad, the greatest city in the world. Ancient thought was imperialized, i.e. to appropriated, naturalized within the Islamic imperial and religious cosmology, and brought into subjection. The Abbasids considered themselves victors in a multifaceted rivalry with Byzantium, which included a contest over the legacy of the Hellenistic world. The Abbasids claimed a translatio studii et imperii from Constantinople to Baghdad. The swiftness with which Muslim armies had conquered most of the Byzantine Empire, and had laid siege to Constantinople twice within the first century of Islam (although unsuccessfully) was evidence of God’s favor toward Islam. The Byzantines were culturally degenerate, for which Christianity was to blame. The Iconoclastic conflicts, which gripped Byzantium on and off for over a century, and resulted in the ultimate victory of the pro-icon faction (Iconodoules), were, in Muslim eyes, divine punishment on the infidel Christians for their idolatry, one of the worst sins, according to Islam. So, although the Byzantines spoke a form of Greek, they had lost both the capacity for and the rightful heirship to the ancient Greek intellectual legacy. However, the Arabic translations were not a simple transfer of Greek thought into an Arabic context. In the case of philosophy, all of the ancient schools were dead—Stoicism, Epicureanism, Peripateticism, Platonism—their chains of transmission from master to student were broken in Late Antiquity, as Dimitri Gutas and Pierre Hadot have discussed. There was a disorganized mass of writings, but no living guide to sort it all out and show both what was most important as well as the proper order to follow in mastering philosophy. The translations were done a work at a time—a gradual appropriation and assimilation—without a broad overview of the doctrines of any school, at least at first, nor of the Greek intellectual legacy in general. How would one go about acquiring this Greek knowledge? One could approach it with reverence and awe, and try to reconstruct it as accurately as possible, producing word for word translations, attempting to master the doctrines of the individual schools, for example. Or—and this is what actually happened—one could view it as a resource from which to draw whatever tools one might need for one’s own intellectual projects. This is what the 9th Century Arab Muslim philosopher al-Kindi did in his diverse studies, his initial forays into Greek philosophy. Employing ideas and methods from the Greek philosophical corpus without regard to their original sectarian contexts, he effectively re-invented philosophy, but in a fresh, new, and dynamic form. Elements of Greek philosophy were like spolia from old buildings used in new ones, such the columns of the Umayyad Mosque of Damascus. His writing addressed specific problems, and he gathered whatever he needed to solve them, commissioning translations in the process. Al-Kindi’s confident attitude was a byproduct of his imperial culture: everything was available for his use. His philosophical projects spurred the Translation Movement by showing the benefits to be derived from Greek texts. Al-Kindi set philosophy on a whole new course that led directly through the intellectual advances of Islamic civilization, as well as the later developments in Latin Europe. In effect, al-Kindi’s fresh and creative approach to philosophy revolutionized that discipline, making all subsequent advances possible. So, he will take useful knowledge from wherever he can find it. In the next passage, al-Kindi reveals an extreme confidence with regard to his Greek source material: he claims to be able to identify the gaps in ancient thought, and not only to fill them, but also to bring them to a fulfillment that they may never have had before—and were never intended to have. Al-Kindi’s project was to master the elements of Greek thought and to acquire its best fruits, in three stages: 1) To outline what the Greeks said; 2) To identify its weaknesses and fix them, and 3) To complete what they left unfinished. Thus, something new was created. In retrospect, perhaps science and philosophy could truly advance beyond the confines of the antique schools only in an imperial environment with a sense of cultural superiority, where intellectual inquiry could proceed confidently and free of self-consciousness. And where all available knowledge was open to inspection, where knowledge was meant to serve greater ends. This confidence with regard to Greek sources also appears in Arabic thinkers’ approach to Ptolemy’s astronomy. The Almagest was criticized and corrected over several generations by Arabic astronomers, using criteria they derived from Greek thought itself—especially from Aristotle. 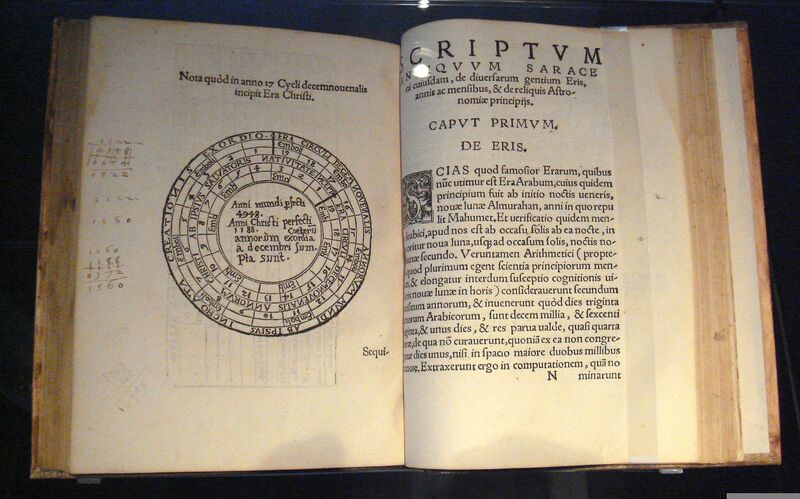 That lead to many creative developments, including, remarkable, elements of Copernican astronomy. 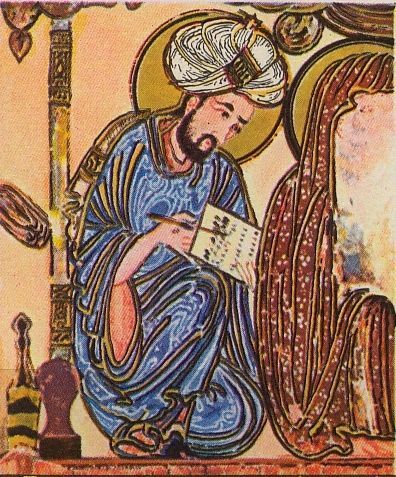 By the time of Gerbert d’Aurillac’s epic 10th C. journey to Spain in search of Arabic math and astronomy texts for the church (he was sent by his bishop—science in the service of religion), the disparity in knowledge between Islam and the West was so great that, after he returned to Christendom, having learned much from Arabic authors, and later became Pope Sylvester II, he acquired a reputation for sorcery—false, of course. No one could know that much without having made some Faustian pact with the devil! The Arabo-Latin Translation Movement, which began in the 11th Century, differs from the Baghdad case on several points. The greatest difference was the relative stances of the source and target civilizations. Latin Europe was significantly less advanced than the civilization of Islam and had been mainly on the defensive against Islam for several centuries. Whereas the Greek to Arabic movement was centralized in Baghdad, the Arabic to Latin movement had several centers of translation activity, including Toledo in Spain and Monte Cassino in Italy. Furthermore, the Latins, at least in the early phases of their translation movement, approached the intellectual treasures of Islamic civilization with awe and an awareness of their relative backwardness. It was several generations before Latin translators and their patrons thought of themselves as equals and then, eventually, superiors of Islamic thinkers. By the time of the Renaissance, a vocal faction among the humanists called for the purging of Arabic from the classical intellectual tradition, and for a return to unadulterated Greek sources. As I myself have argued in the case of Galen translations, and a similar thesis is argued more broadly in a recent book by a Dag Hasse, although the sciences and texts from Arabic authors formed a major part of the foundation of the Renaissance, these very authors and the whole Arabic heritage were erased and forgotten from the intellectual history of the West. 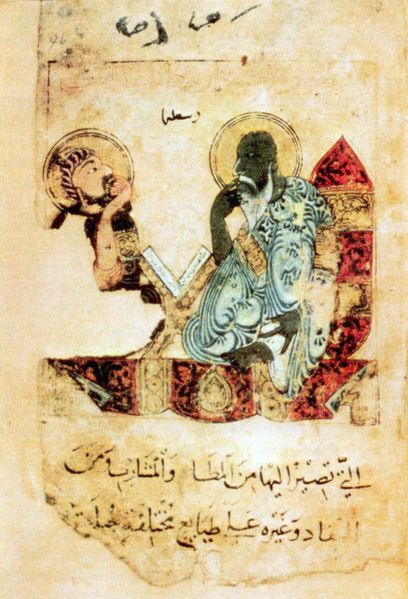 In the early period of the Latin translations, which began in the mid to late 11th Century, the Latins sought to emulate the Islamic intellectual model that they saw in Spain, relying on Andalusian Muslim intellectuals to show them what were the most important authors and works, as they sought to appropriate the intellectual riches found in Islam—at first math and astronomy to serve the Church, but later a flood of other classical authors found there—philosophy, medicine, and the rest, especially works by Aristotle, Ptolemy, and Galen—which revolutionized the European intellectual and educational landscapes. They did not, however, seek out the latest and best Arabic scholarship, much of which was in the Islamic East—at least in the earliest phases, nor did their fellow Christian crusaders in the Holy Land show much interest in the intellectual riches of Islam. That would happen later among the “pro-Arabic” strand of Latin thinkers. The quality of the early Latin translations was also poor, preferring a “text-oriented” rather than a “reader-oriented” approach. This two-fold scheme reflects the attitude of the translator to the source text, which I have employed in my analysis of Greco-Arabic translations. The text-oriented approach is not necessarily inferior, but it often correlates with a tentative approach to the source texts. The former attempts to convey every textual detail of the source text into the target language, as if the revered source text were not to be changed. For this reason, the pioneering medical translations of Constantine the African, for example, had to be redone a generation later. On the other hand, a “reader-oriented” translation results if the translator has the reader in the target language as his primary concern, and uses intratextual commentary, definition, or exposition of the cultural context in the target language, to convey the meaning of the source text and to render it as useful as possible. The latter description applies to the 9th C. translation activities at Baghdad, when translators and scholars, such as Ḥunayn ibn Ishaq and al-Kindi, approached the Greek corpus with a robust confidence. As the Latin Translators reflected upon the art of translation, they classified translation styles in two groups, roughly corresponding to the two I just described. The first, Ciceronian, presents a freer rendering, just as Cicero translated and transformed Greek philosophy into elegant Latin. The second, the fidus interpres style of Boethius, as understood by the Medievals, strives for a word for word precision to capture the original, but often results in inelegant Latin. While there were attempts to render Arabic texts in the manner advocated by Cicero, the tendency of early Latin translators was to follow the Boethian text-oriented approach. This may at first have been the result of lack of confidence, but even as the translators and scholars developed confidence, this style was still the ideal. Cicero’s freer translation style reflected both his stance with regard to vanquished Greece, and his own anxiety about his social class as a parvenu to the senatorial ranks. Moreover, Greek philosophy was among the spoils of Roman conquest to be shaped and Latinized as he liked. Cicero insisted that only one with oratorical command of Latin should do translations, in order to protect the influx of Greek literature from the corruptions of those without the proper education and social standing. Only a man who had achieved the highest education available in Rome and had been mentored by a member of the aristocracy possessed such credentials. Boethius, on the other hand, though Roman by culture, was a conquered subject of barbarians. His project to render Greek philosophy into Latin as accurately as possible was urgent, and so he wanted to capture all of the subtleties of the original texts as possible. His efforts were not the results of lack of confidence, but striving for accuracy and preservation. In effect, those following the Boethian style consciously sought to replace the originals with their translations—to preserve every feature. Boethius showed that this could be done gracefully. The disparity in intellectual development and anxiety about closing the gap between Christendom and the world of Islam is reflected in a number of prefaces written by Latin translators for their translations or other works based on Arabic material. As more Arabic texts became known, Latin thinkers were increasingly aware of the intellectual poverty of their own culture, while simultaneously coveting the intellectual wealth of the Islamic/Arabic world. The “abundance of the Arabs” compared with the “poverty of the Latins” was a recurrent theme. Plato of Tivoli (d. 1146) stated it best, when he said that the Arabs have all the great authors, both Ancients: Hermes the Egyptian, Abrahis, Aristotle, and Ptolemy, but also their own: Algorithmus, Messahala, and Albategnius. Moreover, not only do we Christians not have a single author on that level, but instead of books, we have nonsense, foolish dreams, and old wives tales. 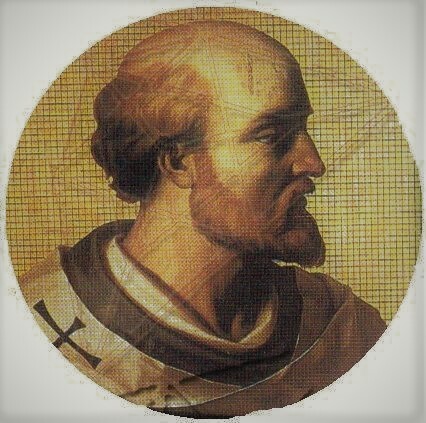 In astronomy, Petrus Alfonsi (d. 1130), a Jewish convert, urged his fellow Christians to abandon the Latin astronomy of Macrobius, and welcome the new doctrines from the East, which were based on fresh observations. The most influential proponent of the Arabic-derived sciences was Adelard of Bath (d.c. 1152), who was also one of the best, for whom it was the new logic and the emphasis on personal observation that made them superior. He compares the rational and progressive Muslim culture, to his own, which he says is led by authority like dumb beasts wearing a halter. Peter the Venerable (d. 1156) was the first to weaponize translation from Arabic for Christian apologetics, in the battle against Islam, as he sought to educate Christians about Islam and Muhammad. In effect, he opened a new battlefront against Islam, in the intellectual realm. He compared his translated biographies of Muhammad and religious tracts to swords and missiles, to refute Islam. This intellectual war against Islam later produced Ramon Llull (d.c 1315), perhaps the most zealous and intellectually best prepared of all Christians proselytizing among the Muslims. Byzantium presents a case of a formerly dominant imperial civilization that is on the defensive against, and has been surpassed by another civilization. During the High Abbasid period, there was a significant amount of knowledge flowing from Arabic to Greek. But Byzantine authors sometimes deliberately obscured their Arabic sources. Some authors, when discussing Byzantine-Arab relations, exaggerate the cultural superiority of Byzantium, manufacturing “alternate facts”, which play down Muslim advances and paint Byzantium in the best light. Later on, Byzantium had its own confident intellectual flowering period again. 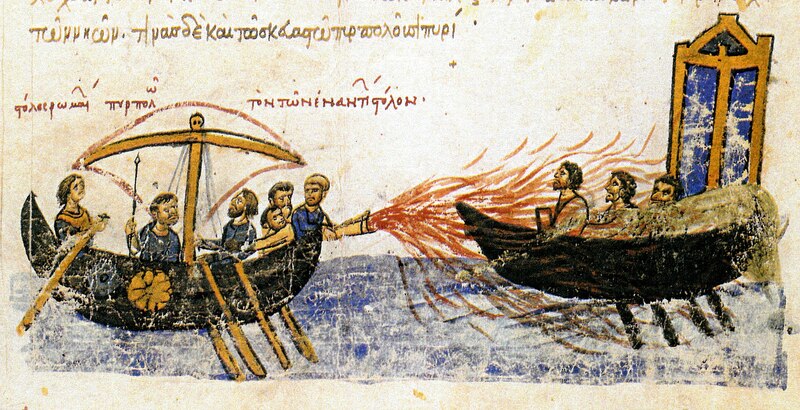 An example of cultural exchange between Baghdad and Constantinople from the “Macedonian Renaissance” period of the 9th to 11th Centuries is deliberately distorted in one Byzantine source, in order to preserve the myth of Byzantine superiority over the infidel Arabs, and reflects Byzantine anxiety about having fallen behind. Two accounts of the same events have survived, which can be compared. The Caliphate was much wealthier than Byzantium, which provoked a competitive reaction in Byzantium, of the sort that Byzantium usually elicited from the less advanced cultures of western Europe. 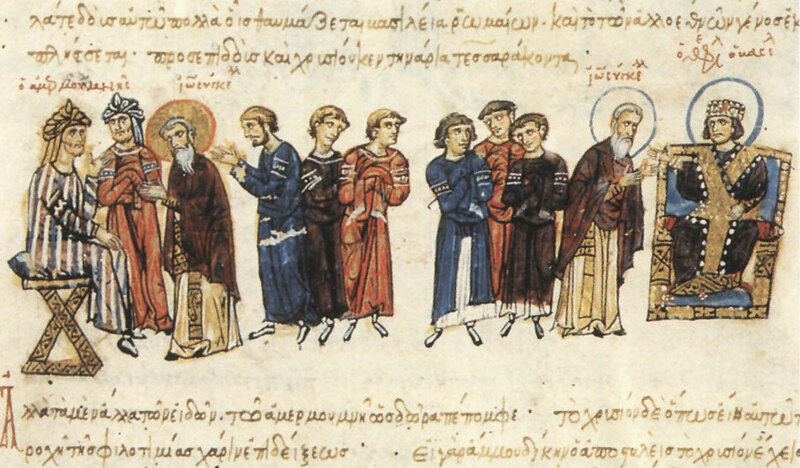 According to the first source, in the 830s, a student of Leo the Mathematician, the leading Byzantine scholar of that time, had been captured by the armies of Caliph al-Ma’mun in one of the frequent border clashes between Byzantium and the Caliphate. The caliph was impressed with the student’s mathematical skills, and so he wrote the Byzantine emperor, stating that if the student is of such fine quality, the teacher must be even better, and invited Leo to come to Baghdad and educate his court, for which he would be richly rewarded. The student was released and allowed to return to Constantinople bearing the Caliph’s letter to his former teacher. Leo, to avoid being suspected of treason, dutifully reported the letter to the emperor, who was so impressed that he awarded Leo with money and a promotion. When the Caliph realized that Leo had rejected his offer, he wrote to Leo with difficult problems in geometry and astrology for which he needed solutions. Leo readily provided these, and the caliph was now mad with desire to have Leo at his court, and wrote directly to the emperor, praising Leo’s outstanding abilities, and wouldn’t he please force Leo to go to Baghdad, in exchange for which he offered a pile of gold to the emperor. However, once the emperor saw how Leo was so valued by a foreign ruler, decided to keep such a prize for himself. However, close comparison with Arabic and other Greek sources show that the caliph could not have been al-Ma’mun, but his successor, al-Mu’tasim. It is also clear that the historian of the first source has twisted and embellished the story, to make it more ideologically pleasing to the regime, to cater to Byzantine pride in their own heritage. Leo the Mathematician is made into a representative of the “national asset” of Greek learning, which like other famous Byzantine assets—Greek Fire and purple-born princesses—were not to be exported. A later historian corrected these details. Moreover, the first version contains absurdities. For example, al-Ma’mun had the best mathematicians in the world at the time in Baghdad, including the inventor of algebra (al-Khwarizmi), whereas the level of Byzantine mathematics was rudimentary—so, why would he seek help with his math homework from Constantinople? In her 12th Century Alexiad, Anna Komnene, sometimes garbled the details of her Arabic sources. 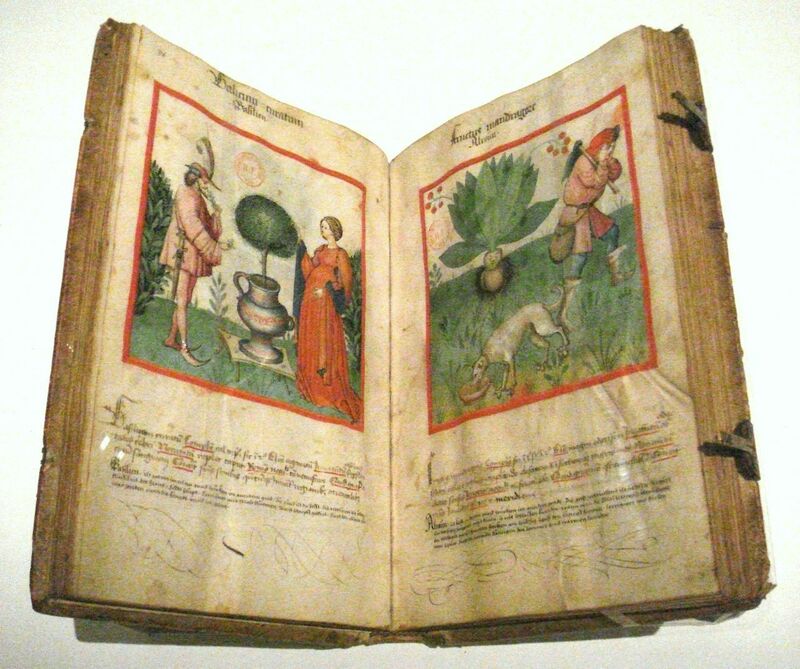 In her account of the history of astrology, for example, while emphasizing the Ancients’ contributions, she obscures the advances made by Muslims in the technical aspects of that field, namely, mathematical astronomy, which made a more precise form of astrology—almost scientific—possible. Given her associations with the intellectual elites of her society, it is difficult to imagine that Anna could have been unaware that the latest advances in astrology and mathematical astronomy, which were avidly studied in Byzantium, came from the Islamic world. 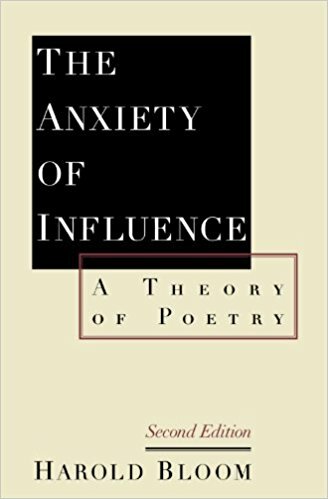 The American literary critic, Harold Bloom, proposed a model for understanding how the creative activity of a later poet relates to that of an earlier, precursor poet, in The Anxiety of Influence. This model has features that could help us understand the succession of cultures through translation. Bloom explains how the later poet is both influenced by his precursor, but also how he must break free, asserting his independence, to create original work, a process that is fraught with anxiety. The process, Bloom explains, involves: creative misreading of the precursor; taking the precursor’s work in new directions, under the pretext of completing what the precursor left unfinished; diminishing the originality of the precursor and distancing oneself from the precursor, to clear the way for asserting the successor’s independence; and, finally, the triumph occurs when the precursor’s work is understood in terms of the successor’s. The key idea here, I think, is the anxiety the successor has toward the precursor, and in the process of intellectual and artistic growth, is both acknowledging the debt to the precursor but also is breaking free of it, to produce original work. Bloom’s model is designed to be applied to individual poets. Civilizations obviously don’t feel insecure or envy or superiority, or anything at all—people do. So, a Bloom-like model could refer to general attitudes that are adopted by individuals, or they could reflect an average societal mood or attitude. And it doesn’t apply to everyone, since there are always exceptions. Considered in full, the Bloom model applied to the succession of cultures would be cyclical, in a manner such as the Greek historian Polybius and the Muslim, Ibn Khaldun, outlined, where successions of civilizations are described, with phases of growth and decline, like living organisms, explaining the process of decline, conquest, and cultural assimilation by new powers. Each of these historians was writing toward the end of the heyday of his respective civilization. 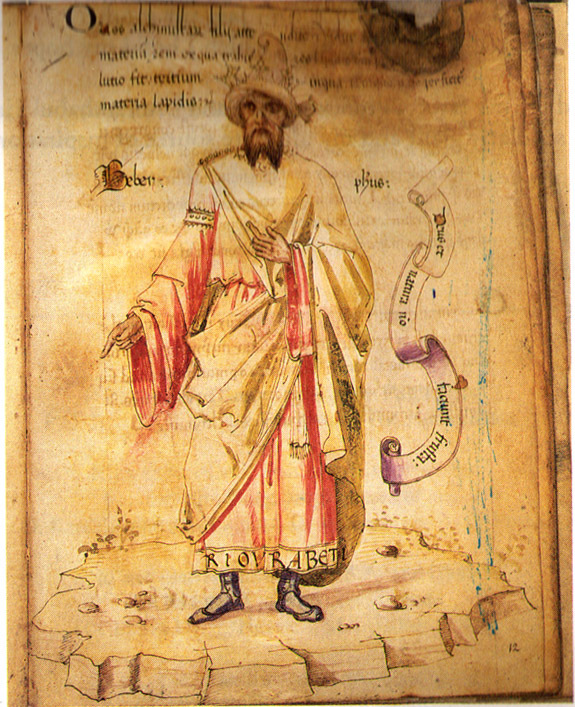 Polybius was describing the conquest of his culture by the Romans, which he was observing firsthand; Ibn Khaldun was writing after the breakup of the Abbasid Empire, and the disintegration of the Umayyad and Fatimid caliphates, and the more recent decline of the Almohad Empire in the West, and he was trying to account for the historical process of the growth and decline of states. Here I consider only part of the cycles. For the creative misreading phase, the act of translation itself is always a creative misreading, which varies in its creativity whether it’s a text-oriented or reader-oriented translation. Additionally, in the Greco-Arabic case, al-Kindi took from Greek philosophy whatever he needed, with little regard for ancient Greek context or sectarian boundaries, and created a new and more powerful intellectual tool—one that made all subsequent developments in philosophy possible. For the next phase—taking the precursor’s work in new directions, and completing it—al-Kindi was self-consciously doing this, as noted. In Europe, as in Islam, this phase consisted of using the tools of the precursor for theological exposition and debate—something not intended by the original authors. Examples include: Thomas Aquinas, Maimonides, and Ibn Rushd. In Islam, the Greek legacy begins to be diminished by the religious scholars after they see it to be in competition with Islam itself. The Greek contribution is recast in terms of the Islamic views of revelation history and Islamic Law, and it is condemned as heretical and un-Islamic—ironically, however, by men who used the very intellectual tools derived from Greek to form their legal and theological arguments. This is itself an instance of the Anxiety of Influence, of “Success and Suppression”. In the Arabo-Latin case, this is expressed when Peter the Venerable weaponizes translations of the Qur’an and other Muslim religious literature, and when Islam begins to be understood as derivative, even a corruption or heresy of Christianity—the latter actually began soon after Christians became acquainted with Muslim doctrines and practices, and the trend culminates with Ramon Llull. The final phase, when the precursor is understood in terms of the successor, is manifest in Islam when al-Ghazali (d.1111), whose career wouldn’t have been possible without Greek thought, repudiates it, and whose writings paradoxically lend rational support for a non-rational turn in Islam. And in Europe, it is reached when scholars begin to describe Arabic authors as useful only for getting us to the point where we could appreciate the pure Greek—the Arabic must be discarded as a corrupting, intermediary distraction. n conclusion, there were a variety of translation styles that appear to correlate with power asymmetries between translator and translated, power relationships that changed in a cyclical pattern. This kind of analysis has promise for understanding broad patterns of cultural competition and exchange, and the transition and reception of ideas from one culture to another. It is especially useful for the pivotal Greco-Arabic and Arabo-Latin receptions, the consequences of which reverberate with us today, whether remembered and acknowledged, or, more often, forgotten or viewed with hostility. Unless we pay close attention to who was translating, for whom, and under what power relationship, we’ll miss important details about the transmission of ideas. As the cyclic character of the models I sketched suggests, the issues that I’ve been discussing are perennially relevant, and no more so than today. As an American, I live in a culture that accesses the rest of the world, both ancient and modern, via translation. English is the most imperial and widespread language in history. There is, of course, a connection between that fact and the notorious American lack of interest in the subtleties of foreign cultures. And nowhere are anxieties of influence more manifest than in the modern West’s coming to terms with the diverse strands of its cultural heritage—or, more often, not to come to terms with it! Medieval studies, whose purview is the world before the modern world, is an appropriate place to widen the boundaries, lengthen the table, humbly acknowledge debts, and invite more to the feast. And, what a glorious feast it could be! The phrase “From Baghdad to Barcelona” is borrowed from: From Baghdad to Barcelona: Studies in the Islamic Exact Sciences in Honour of Prof. Juan. Vernet, ed. J. Casulleras and J. Samsó, Barcelona: Instituto “Millás Vallicrosa”, 1996. Gutas, Dimitri. Greek Thought, Arabic Culture: The Graeco-Arabic Translation Movement in Baghdad and Early ‘Abbasid Society (2nd-4th/8th-10th Centuries). London: Routledge, 1998, pp. 83-95. Gutas (2010: 21-2) and Gutas (2004: 195).. Occasionally the translators found an ancient reading list that served as a guide to what books were important and the order of reading them. Yet, the present concerns always superseded. Translation (adapted) from Adamson/Pormann: The Philosophical Works of al-Kindi, “On First Philosophy”, p.12. Moreover, al-Kindi’s invocation of a transcendent “Truth” as an organizing principle suggests that he saw himself on the more powerful end of a relationship with his sources. Hasse, Dag Nikolaus. 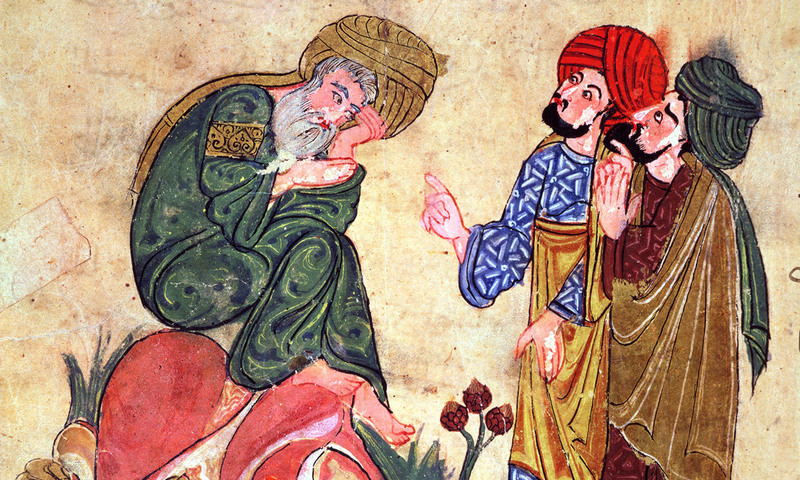 Success and Suppression: Arabic Sciences and Philosophy in the Renaissance. Cambridge, MA: Harvard University Press, 2016. See: Gutas, Dimitri. “What Was There in Arabic for the Latins to Receive? Remarks on the Modalities of the Twelfth-Century Translation Movement in Spain.” Wissen Uber Grenzen: Arabisches Wissen Und Lateinisches Mittelalter (Miscellanea Mediaevalia 33). Ed. Andreas Speer, Lydia Wegener. Berlin: Walter de Gruyter, 2006. 3-21. I have adapted the scheme from Sebastian Brock: Sebastian Brock, “Towards a History of Syriac Translation Technique,” Orientalia Christiana Analecta 221 (1983): 1–14; here, 4ff. See my: Cooper, Glen M. “Ḥunayn Ibn Isḥāq’s Galen Translations and Greco-Arabic Philology: Some Observations from the Crises (De Crisibus) and the Critical Days (De Diebus Decretoriis).” Oriens 44 (2016). See: McElduff, Siobhán. “Living at the Level of the Word: Cicero’s Rejection of the Interpreter as Translator.” Translation Studies 2.2 (2009): 133-46. Gázquez, José Martínez. 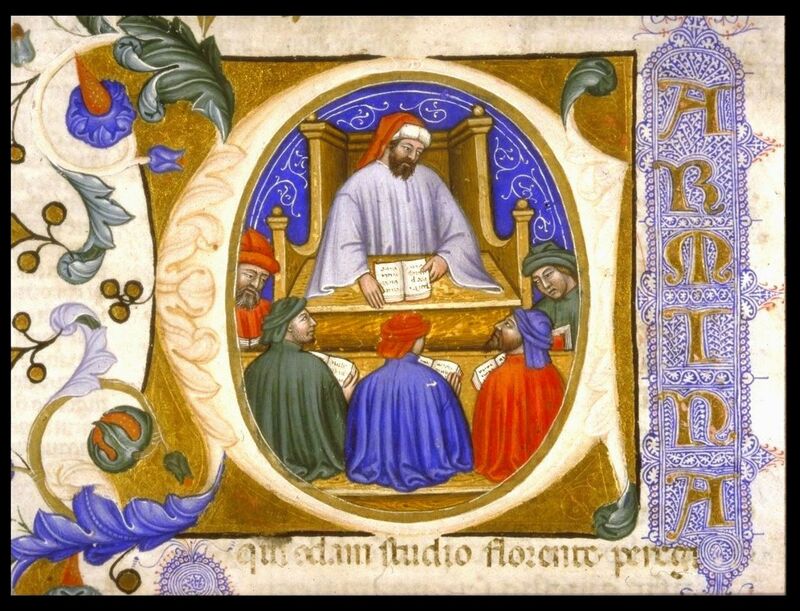 The Attitude of the Medieval Latin Translators Towards the Arabic Sciences. Florence: Sismel - Edizione del Galluzzo, 2016, p.12. See: Magdalino, Paul. “The Road to Baghdad in the Thought-World of Ninth-Century Byzantium.” Byzantium in the Ninth Century: Dead or Alive? Ed. Brubaker, L. Aldershot: Ashgate, 1998. 195-213. Gutas, Dimitri. Greek Thought, Arabic Culture: The Graeco-Arabic Translation Movement in Baghdad and Early ‘Abbasid Society (2nd-4th/8th-10th Centuries). London: Routledge, 1998, p.180. She is careful to explain that she studied astrology in order to refute its false claims.